After the successful regional Model European conference last week, the Hong Kong edition kicked off in the evening of 22th April at HKBU, in association with European Union in Hong Kong and Macao. The HKMEU started with the welcoming speeches by the honorable guests including Prof. Adrian Bailey (Dean, Faculty of Social Science, HKBU), Mr. Vincent Piket (Head, European Union Office to Hong Kong and Macao) as well as Prof. Jean-Pierre Cabestan (Director General of the EUAP). 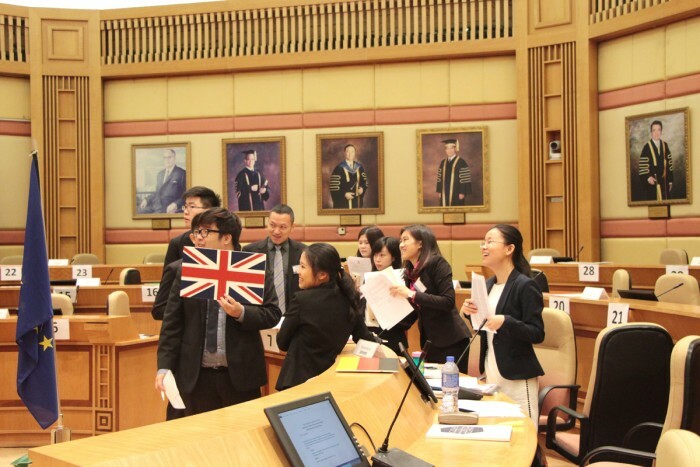 This year there are 32 delegates representing 18 EU member states from HKBU, HKU, CUHK as well as Lingnan University. They gathered to discuss the European migrant crisis. « The Decline of the Centre Left in Europe?